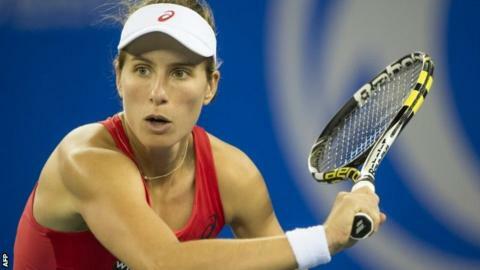 Johanna Konta saved six match points but lost 6-3 7-5 to Madison Brengle in the second round of the Linz Open. It was the British number one's second defeat in Austria, having only reached the main draw as a 'lucky loser'. In a second set of nine breaks, Konta rallied from 0-40 when Brengle served for the match at 5-4 and again from 15-40 two games later before succumbing. Heather Watson reached the quarter-finals of the Hong Kong Open, beating Chinese Taipei's Lee Ya-Hsuan. The 23-year-old British number two, ranked 61, won in three sets, 6-0 6-7 (5-7) 6-4, and will face 2009 US Open champion Sam Stosur in the last eight. It is Watson's first quarter-final since winning in Hobart in January. For Konta, at a career-high ranking of 47, it was only a fourth defeat in 27 matches since Wimbledon. Her loss to world number 105 Klara Koukalova in qualifying was her first to a lower-ranked player since May.